CM Magazine: Brady Brady and the Cleanup Hitters. Waterloo, ON: Brady Brady Inc. (P.O. Box 367, N2J 4A4), 2008. April was a busy time of year. It was when Brady had to clean out his closet and recycle the stuff he no longer used. Brady Brady, your room is a pigsty! His [sic] mom explained. Time for spring clean-up. His mom called it spring cleanup. Brady called it a waste of time. After all, April was also the start of the baseball season and he had better things to do. He couldn't wait to get out to play. There was no first base, no home base, and no pitcher's mound. But there was a mound of garbage! Heaps and heaps of garbage everywhere! 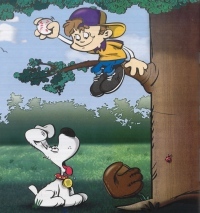 Faced with not being able to play baseball, Brady comes up with a solution the next day, a solution which leads to his classmates turning into cleanup hitters as they all voluntarily pitch in to clean up the playground's baseball diamond of its mantle of trash. And, while Brady's still in a cleaning mood, he even successfully tackles his own room. 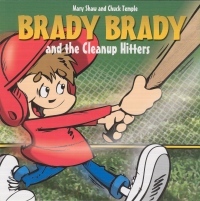 When Brady initially shares with his mother his disappointment about not being able to play baseball at recess, she reframes the garbage-covered baseball diamond situation as its being an example of a larger global concern – … think about how all that garbage might affect the air, the plants, and the animals… – and Brady echoes that same ecological concern to his classmates. While the environmental lesson is valid, it is incomplete in that it does not address those who do the littering. Nonetheless, Brady Brady and the Cleanup Hitters is a delightful, quick read, one that fans of the series will enjoy. Once again, Temple's bright cartoon style illustrations reflect the story's emotions. His rendering of Brady Brady's very messy room will definitely resonate with many parent readers.